I love the creative layout of the Samsung Galaxy Note website. What’s important is that it captures your attention because it’s so simple and well executed. The creative rendition is essentially a board full of post-it notes with a mouse tracker, which is a hand with the ‘smart pen’. 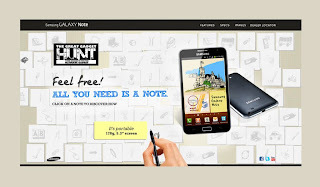 As you mouse over the notes you discover the key features and you can click to know more. The ‘Note theme’ continues in the inside pages as well as page transitions (which have pre-loader icons made of notes & one-liners). The attention to detail is amazing. There are video demos, detailed specifications and image galleries. 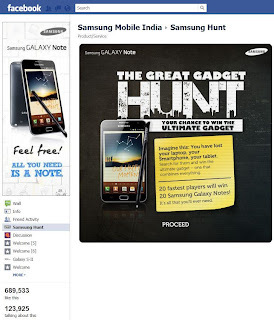 On Facebook, Samsung is running ‘The Great Gadget Hunt’ which is essentially an application on the Samsung Mobiles Facebook Brand page. The idea is to search for your lost laptop, smartphone & tablet in the shortest possible time using the clues provided in different scenarios. 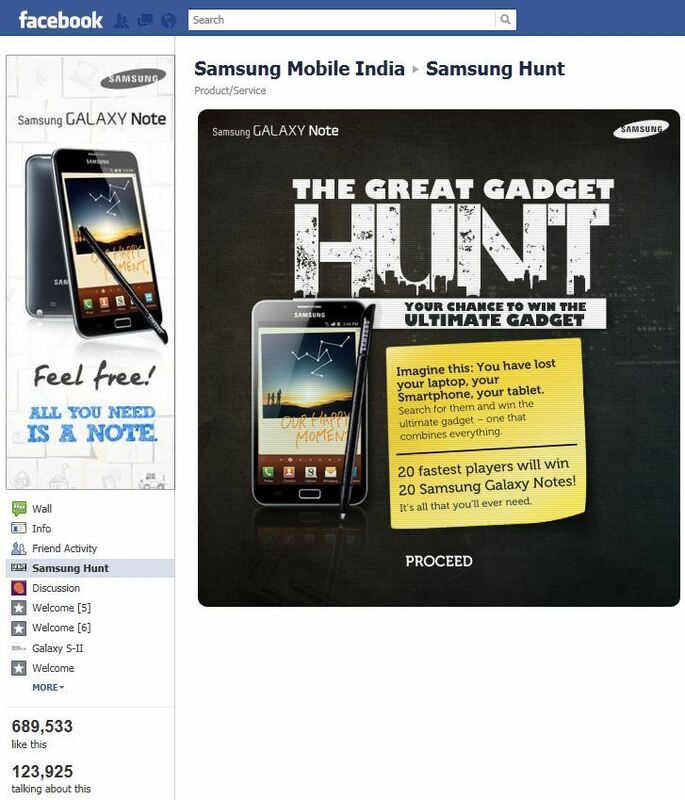 A different location is revealed every few days – great idea to get the users to keep coming back to engage. 20 players who crack this in the best time stand a chance to win the Note. Bugbear Alert! The application asked me to register to get started. What’s the point of a Facebook Connect if I have to submit more personal details? Not sure why they needed my email id and phone number. I have enough spam on my email & phone already. Thank you. The application starts with a great intro video (with sinister background audio) customized with your Facebook pictures & personal information, setting the context for the hunt. Don’t skip it!